Jay Kinghorn's Blog | Is Photography A Performance-based or Post-processed Medium? 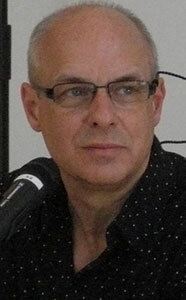 Image of Brian Eno by cosciansky. CC-attribution license. In thinking about the future of photography, I’ve been wondering how the craft will evolve as post-processing tools become ever more powerful and our skills at conveying emotion through the use of color, tone and contrast match the sophistication and subtlety of the available technology. I found some interesting parallels between photography and music in a transcription of a lecture Brian Eno delivered at the New Music America festival in 1979. In it, he demonstrates how the process of recording music transformed the art from transient, performance-based medium to one that is permanent and frequently a creation of the studio and mixing board. Improvements in recording technology opened doors to new types of music creation. Some artists, like Brian Eno, create their work entirely in the studio, a musical composite if you will, from pieces of music performed, recorded, spliced together and recorded again. Advances in image post processing, from sophisticated deblurring to the ability to easily insert 3d CGI objects into a 2d scene, the malleability of a photograph begins to match Eno’s description of “working directly with the material.” I find this tremendously exciting, though I know, it scares the hell out of those who look at the primacy of an original, unadulterated photo as paramount to the craft. My hope is that as our craft evolves, we’ll be better able to look at using the tools for what we can say with them rather than the polarized, almost fundamentalist philosophies that many hold today. After all, documentary photography has never been more vibrant, despite the proliferation of movies like Avatar or Transformers, where entire scenes are generated on a computer. It will be fascinating to see what comes of photography in the next 10 or 20 years. My hunch is we’re on the cusp of a renaissance in the art, particularly as more amateurs share photos online and build upon each other’s work and we see computational photography techniques become mainstream. I’ll leave you with a quote from Eno that I feel encapsulates a philosophical approach toward this new type of photography. Although we don’t have the same temporal aspect of a still photograph, the essence of the quote, to me, remains the same. I majored in philosophy in college and I remember studying this theory about a circular instead of pattern in things (time and progression). Perhaps film will make a comeback in the future? I’m already seeing patterns of the film look from all these film emulators, filters, apps, etc. but none comes close to actual film particularly medium format film (Holgas and Dianas excluded). Carlo, I love the insight. Perhaps we are seeing a circular pattern modified by current technologies and aesthetic sensibilities. Fashion certainly runs in circles. Why not photography?